Political Science vs Betting Markets – Who’ll win the election? Prof Stephen Fisher has produced his latest weekly estimates of the next general election outcome. 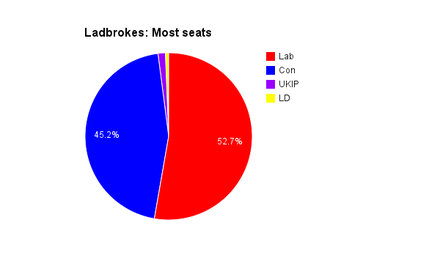 Let’s compare those with the probabilities implied by Ladbrokes’ latest general election betting odds. Pretty close really, which I find re-assuring. 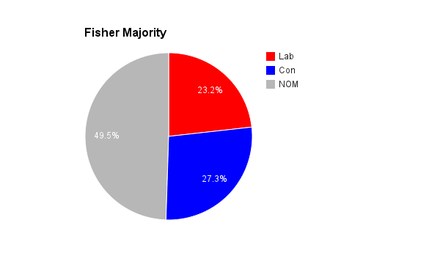 When Fisher produced his initial estimates a few months back, they were a long way out from the betting markets and implied a much higher probability of a Tory seat lead and majority. I assume that the fact that the Tories have not really improved their poll standings in the intervening period has caused most of this convergence. The Fisher model assumes it is most likely that the Conservative vote share will improve as we approach an election, as do the betting markets (but not by as much). Still, if you wanted to have a bet based on the political science, there is a little bit of value. 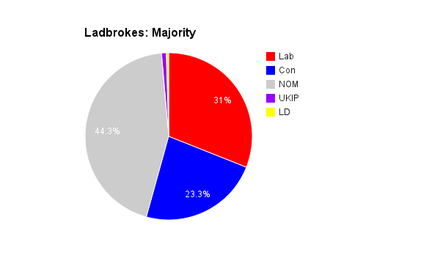 No overall majority at 11/10 with Ladbrokes; the model suggests that should be fractionally shorter. 3/1 for a Tory majority would also make sense. FisherBet would have that at more like 11/4. Conservative most seats is 11/10 with Ladbrokes but around 10/11 with Fisher.